Hello Everyone. 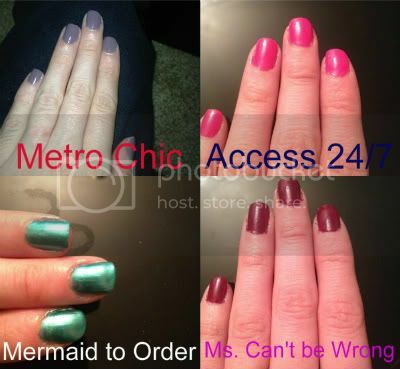 So I decide to have a new feature on my blog called monthly nails. This will show case my nails and what colors I have used for the month. I try to paint them every week a different color. For Christmas I got a O.P.I. Mini set of nail polish. So that what I have been using. So far I not a fan of Metro Chic. Hubby didn't like it either. The rest of the color I used I liked. A lot of people told me they liked Mermaid to Order. I hope you enjoyed this new feature to my blog.